How To Grow Orchids? Want To Learn How? In the wild in the orchids grow primarily in trees as epiphytes or air plants. Sometimes they are in the ground is terrestrials or earth plants. Those that grow from trees tend to make the best houseplants. One key to learning how to grow orchids in your home is simple. 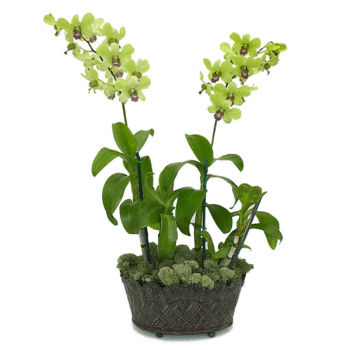 Just select the orchids that fit in your specific conditions. Match what makes the orchid thrive in the wild and they will be happy in your home. 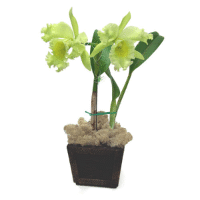 The primary criteria for orchids are light, temperature, humidity, air circulation, appropriate water, appropriate media and correct fertilizer. Let’s look at some of the more popular orchids and how to grow orchids from these orchid genera. Brassia are also called spider orchids. They have slender, pointed sepals and petals that resemble spider legs and the lip is somewhat shaped like the body of a spider. They are often large flowers sometimes the blossoms can reach more than 16 inches from top to bottom. These are exotic and very interesting flowers. Cattleyas are among the most popular orchids. Cattleyas and their various hybrids come in many colors, shapes and sizes. These are the orchids that are known as corsage orchids. These orchids are epiphytes or air plants and they have water storage organs called pseudobulbs. These orchids come in a wild and wide array of colors and many of them are often fragrant. They are considered a good beginner's orchid. These orchids are very popular and prized for their long lasting sprays. Picture. These orchids are relatively easy to grow and often can be grown outdoors. There are two main kinds: the standards and the miniatures. Miniatures are recommended for the locals where the nighttime temperatures are warm, above 70 F. (21 C.). This is a very large and diverse genus of orchids and as such has different cultural needs. Some Dendrobiums go through a growth phase, and then need a resting phase generally in the winter. Water and temperature requirements need to match these periods of growth and rest. The flowers can be very diverse, lasting from one day to many weeks, depending upon the type. If you are going to grow Dendrobiums is important to consider the kind or group when determining the cultural needs. Oncidium is a very large and diverse real-world genus of orchids and has a very wide number of habitats. They can grow from sea level in the tropics to high elevations in the mountains so cultural generalizations are difficult. The plants are often yellow with many many branches with numerous flowers. So they have been fondly nicknamed "Dancing Ladies." This is a very popular and easy to grow orchid. Go to this page for definitive cultural information. Lady slipper orchids are lovely and mysterious group. They are also a relatively easy beginner's orchid. These are semi-terrestrial orchids growing in humus and other material on the forest floor. They are best known for their large pouch that looks rather like a lady slipper. 1) Increased humidity above “normal” indoor humidity (usually 40-70%. 3) Correct daytime and nighttime temperatures. 4) An appropriate watering regime for the kind of orchid. Often the need for a pure water source. 5) Good fresh air circulation. 6) The use of weak (dilute) fertilizer from time to time. 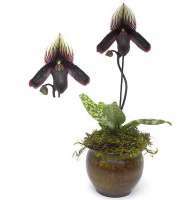 7) An appropriate potting medium and pot (container) or mount for the orchid to grow on. 8) Re-potting or changing the media as it decomposes or as the plant outgrows it.